About the User: this project was commissioned by a client that manufacturers and supplies temporary protection materials for various applications, primarily to the construction industry. The client uses Pegasus Opera 3 accounting and business management solution software to run their business and has done for many years. In order to improve their internal contact management and sales quoting processes, they also implemented SalesForce.com with the Steelbrick quoting add-on alongside. Project Brief: in the absence of an ‘out of the box’ integration, the client engaged us to develop a solution which synchronises their contact, product and pricing between the Pegasus Opera, SalesForce.com and Steelbrick databases. Writing new Customer details from SalesForce.com to Pegasus Opera. Writing updated Customer details from Pegasus Opera to SalesForce.com. Writing Product and Stock information from Pegasus Opera to SalesForce.com. Writing Product Pricing information from Pegasus Opera to SalesForce.com’s SteelBrick module, including quantity and price break details. Support for Pegasus Opera flat file and SQL Server database formats. 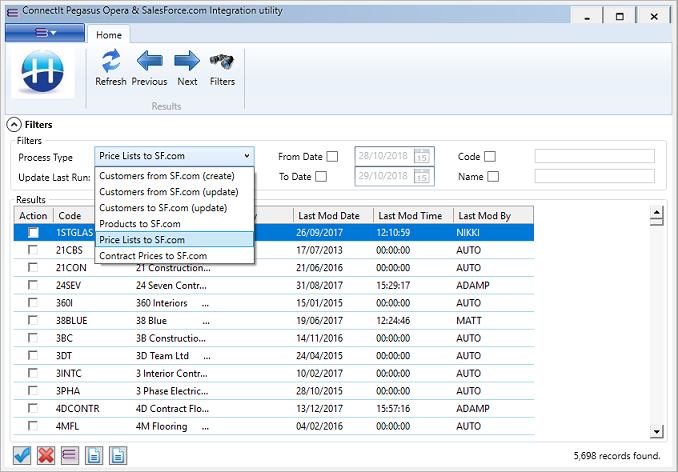 Integration with SalesForce.com and SteelBrick ‘SForce’ SOAP web services. Manual and automatic run modes. Massive time-savings on information entry and maintenance as compared to manually duplicating the details between the two systems. No need for manual User intervention with the automatic weekly, daily and/or hourly scheduled update of information between systems. A very simple User interface to perform all tasks requiring minimal User training. Highly configurable backend options so that changes may be made without requiring a developer to rebuild the application.